A new tool, "Stories to Share", has been launched by Facebook recently. The objective is to make publishers and media sites engage more viewers on their fan page. The publishers' Facebook fan page will suggest content from their sites that they may wish to share with their followers. This tool will appear in the "Insights" section on the fan page. Insights is a tool which displays the graph of your page visitors. 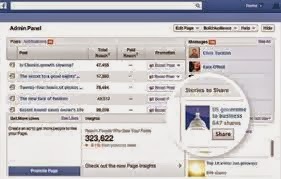 The "Stories to Share" tool will share the news and stories from the sites of the publishers in their fan pages. This will make a big impact for their customers to engage more on their stories and other news. According to Simple Reach, Facebook is the largest driver of social traffic. The news or stories from media sites will be shared on their Facebook Fan page. At present this tool is in the test mode and will be soon implemented. This is another major tool that will drive more traffic to news and publishing sites. For example, CNN.com will suggest its most happening news or stories on their Facebook Page to let their visitors know what is the latest news and latest happenings. To share the news to more people, the tool "Stories to Share" will share or suggest the latest feed in the Insights Dashboard of fan page of any publishing site if they are the "Admin" of that page.